The Webster University Sports Research Conference was held Saturday, Sept. 8, directed by adjunct faculty member Allison Levin and the Webster Sports Media and Analytics Club. The conference invites research presentations on all facets of sports. 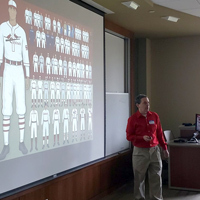 Two presentations were by Webster students, alumnus Jacob Claspille and current junior Alexis LaMarsh, who had presented at this summer's national meeting of the Society for American Baseball Research (SABR).